The oldest leader of the world’s unruly family of fully independent Orthodox Churches and the only patriarch to survive both the Communist era and the post-Communist government’s attempt to oust him, Patriarch Maxim of Bulgaria, died in the early hours Monday of heart failure in Sofia’s University Hospital, the church announced. Having led the Balkan country’s main church for over 40 years, the patriarch demonstrated incredible political resilience against the biggest challenge that any major church institution in Eastern Europe has faced in recent decades. At the same time, he is remembered by those who knew him, including in Russia, as a jovial yet deeply spiritual man. Born in 1914 as Marin Naydenov Minkov, he graduated from the seminary in 1935, was tonsured a monk with the name Maxim in 1941 and represented the Bulgarian Orthodox Church in Moscow from 1950 to 1955. He was consecrated as bishop in 1956, and elected patriarch in Communist Bulgaria in 1971. 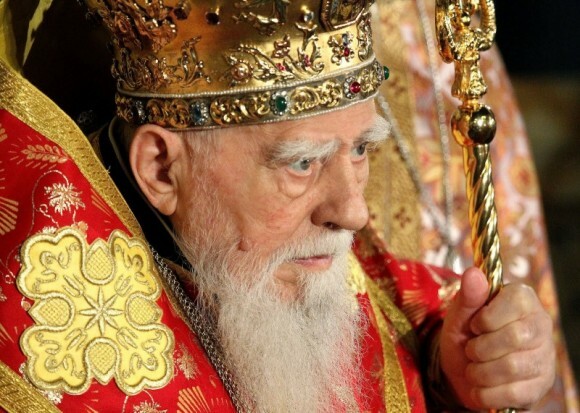 “At that time, it was easier to die than to understand and assess how to live and carry out the duties of the first hierarch of the Holy Church,” Patriarch Maxim said recently in an interview for a documentary about his life. In the interview, he recalled his meetings with Bulgaria’s Communist leader Todor Zhivkov, saying he used them to ask the government to save another church from demolition. “Of course, I committed sins, like all people do, but I never allowed compromises that would harm the Church, and did not even allow myself to think that possible,” the late church leader said. Yet that is not what some post-Communist leaders, and a significant part of Bulgaria’s clergy, thought after the Communist regime in Bulgaria fell in 1989. In 1992, the government led by the Union of Democratic Forces, which saw Maxim as a “Communist stooge”, instigated a split in the church, questioning the legitimacy of his enthronement and setting up an alternative synod led by Metropolitan Pimen of Nevrokop, which eventually ousted Maxim. Although the majority of church members did not follow the new hierarchy, it attracted a number of bishops and priests and was recognized by the government. A long-standing conflict ensued, complete with property disputes, mutual anathemas and a series of failed attempts at reconciliation. Throughout it, Orthodox Churches across the world, including the Moscow Patriarchate, supported Patriarch Maxim as the only legitimate church leader in Bulgaria. While it seemed that all the odds were against him within the country, Patriarch Maxim persevered. In 1998, a pan-Orthodox council led by the Istanbul-based Ecumenical Patriarch Bartholomew of Constantinople, considered “first among equals” by other heads of Orthodox Churches, met in Sophia to confirm Maxim’s legitimacy and reconcile a large part of the breakaway bishops and priests with the Orthodox Church. Yet this did not stop the schism. Only in 2003 did the government register Maxim’s Synod, and in 2004 the breakaway churches were returned to his hierarchy in a sweeping police operation, that was later questioned in the European Court of Human Rights. Bulgaria has always been important to Russian Orthodox believers as the source of its liturgical language, Church Slavonic, and Cyrillic alphabet, used to this day. In the Middle Ages Bulgarians accounted for a sizable community of the learned monks and bishops in Russia. In Soviet times, it was seen as a culturally close Eastern block country which treated its church more liberally than the Soviet Union, and was thus also a source of books and music otherwise unattainable. And Patriarch Maxim, surrounded by an aura of these recent difficulties, if not persecution, is seen and respected as an “elder” even by the senior Russian bishops of today. On the eve of his visit to Bulgaria in April this year, Patriarch Kirill of Moscow and All Russia recalled how his father was appointed to accompany a Bulgarian delegation to Leningrad in the late 1950s and how he remembered, as a child, seeing services led by the “young, energetic and handsome Bishop Maxim.” That memory, he said, created a special atmosphere for his visit some 60 years later. “I have always been surprised by the atmosphere that emerged when he appeared,” Gupalo wrote, responding to questions via email. In recent years, Patriarch Maxim was frail and appeared only for major occasions. According to the Statutes of the Bulgarian Orthodox Church, the longest serving metropolitan – currently Metropolitan Grigory of Veliko Tarnovo – will preside over the church for the next seven days until the Synod elects the interim head. The new patriarch will be elected by the specially convened Council of clergy, monks and laypeople within a four month period. The candidate should be at least 50 years old and must have served as a metropolitan for at least 5 years.